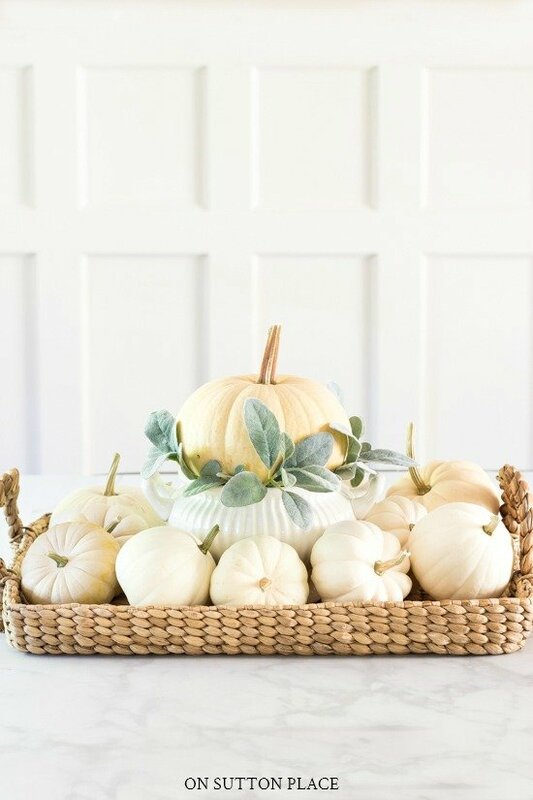 In this post: Simple foyer decorating ideas for fall using both velvet pumpkins and real pumpkins. Includes tips for arranging and how to add interest & texture. 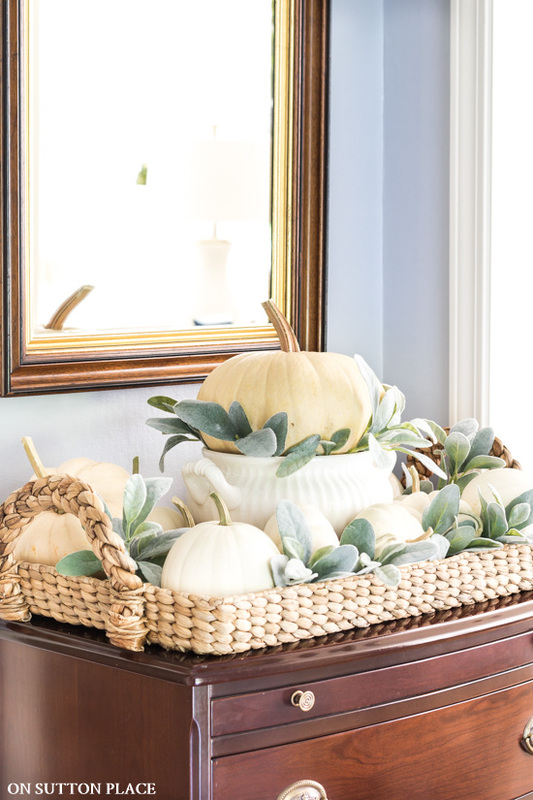 One of the easiest ways to add a simple touch of autumn to your decor is to sprinkle pumpkins around. It adds even more charm if they land in pairs, or small groups. 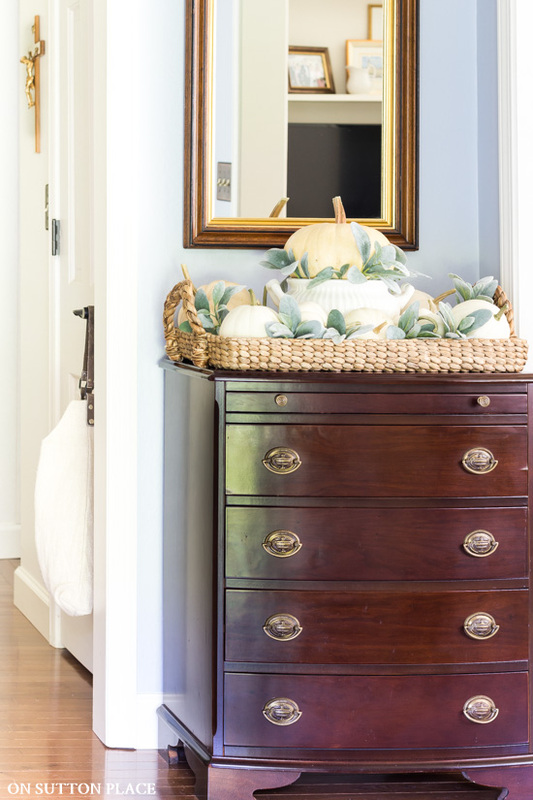 With that in mind, today I’m welcoming you to my little foyer, all decorated and ready for fall. 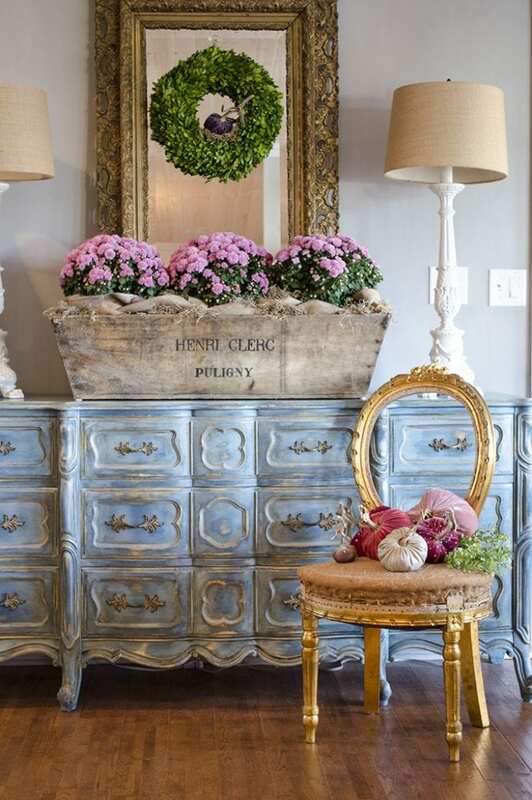 I’m honored to be joining a two-day blog hop hosted by Shelia from Maison de Cinq, who writes a blog brimming with French country inspiration. 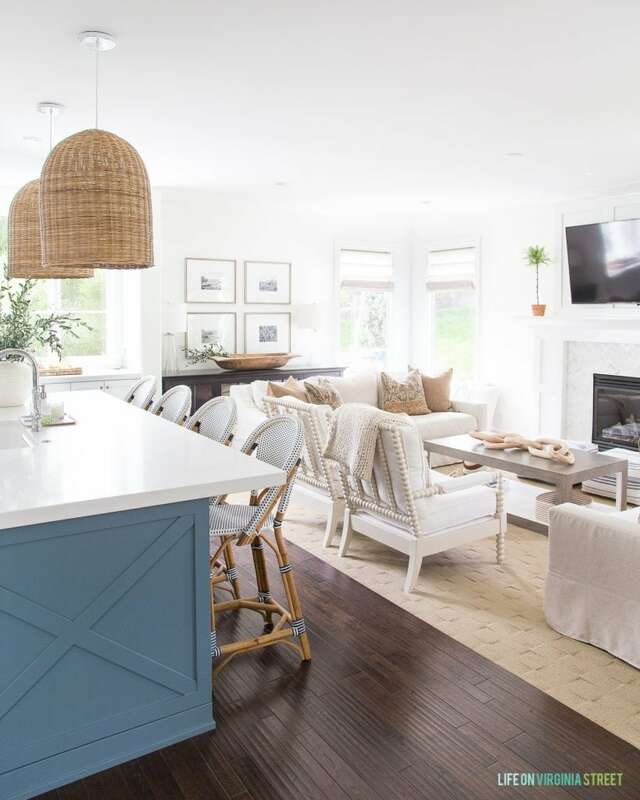 If you are coming over from Designthusiasm, welcome! 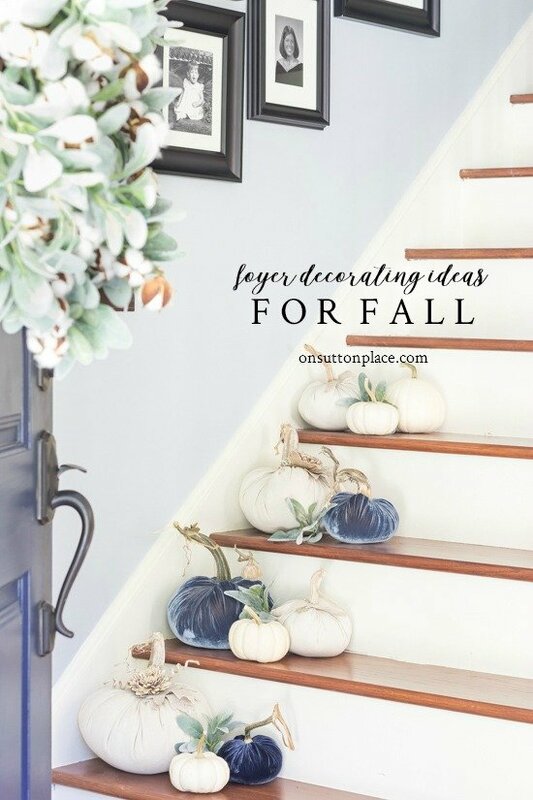 The perfect way to begin is to plop some pumpkins on a stairway, if you have one. I gathered up all the neutral faux pumpkins I had and placed them on the first four treads of our stairs. Since I didn’t want to replace the blue striped rug I added this summer, I combined a few blue pumpkins with the neutral ones. Next I turned my attention to the only other surface in our foyer, a small chest of drawers. Sometimes I like to go with a very simple look, and other times I feel like making a statement. I had picked up more white pumpkins at a local farm market, so I gathered them up and went to work on a statement-maker arrangement. 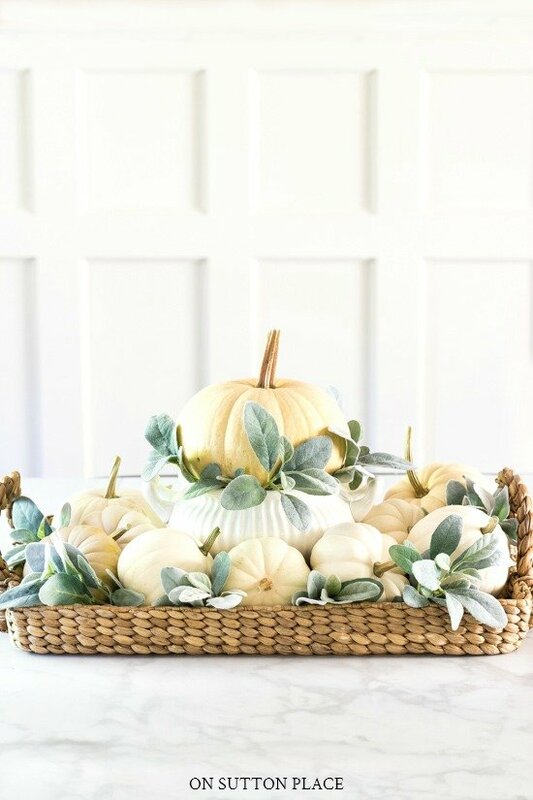 I used a tureen and tray that I already had, so my only expenses were the pumpkins and two stems of lambs ear…and the pumpkins set me back a whopping $8.00! Some sort of tray. It can be any shape and any size. A riser to put in the center of the tray: a tureen, a cake stand or pedestal, an urn or pot. One larger pumpkin and several smaller pumpkins. This arrangement is a bit heavy when it’s finished, so it’s best to place the tray where you want it and assemble it there. (For photography purposes, I put it together in my dining room.) Place the riser piece in the center of the tray. 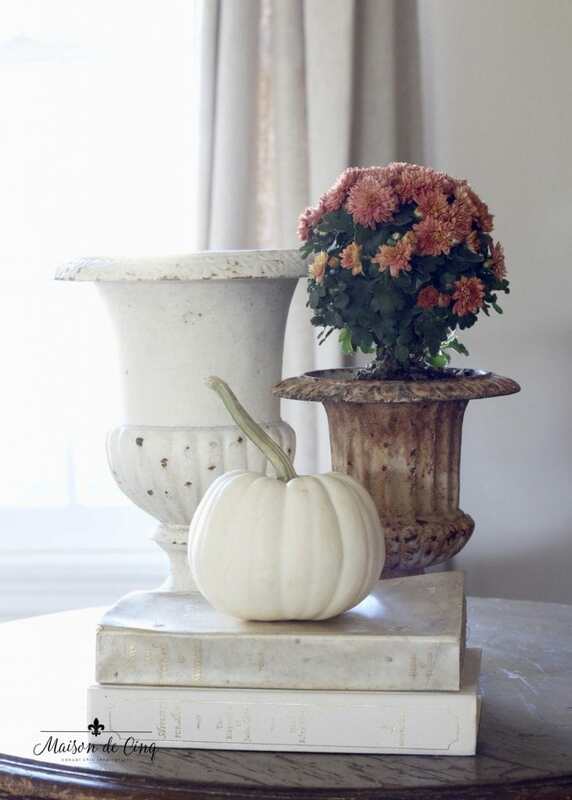 Add the largest pumpkin and surround it with small pieces of greenery. 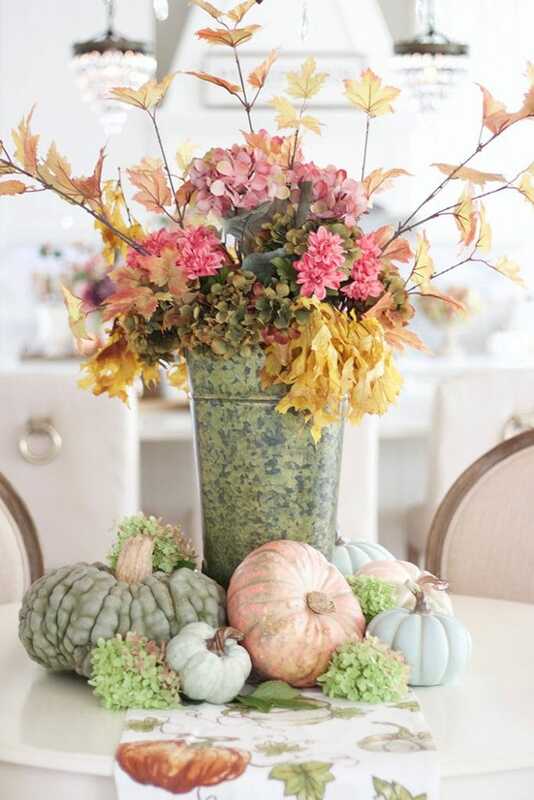 The next step is to surround the centerpiece with smaller pumpkins. There is really no rhyme or reason to placing the pumpkins. Mix up the sizes and turn a few of the pumpkins on their sides. Last, nestle pieces of greenery around the pumpkins. Just stick the greenery in the spaces between the pumpkins to fill in the gaps. I love the way this turned out…and it took literally ten minutes. I used an easy trick to preserve all the pumpkins, so they should last until I’m ready to put up Christmas decorations. 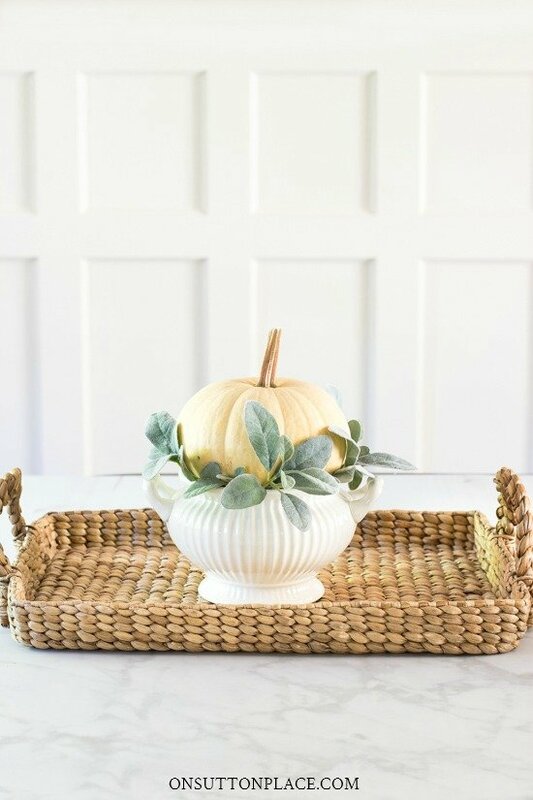 Water hyacinth tray | Lambs ear stems | Tureen (similar) | Grain sack tote | Velvet pumpkins | Drop cloth pumpkins (no longer available) | Striped rug | Paint colors | Ceiling light | Mirror & chest are inherited. 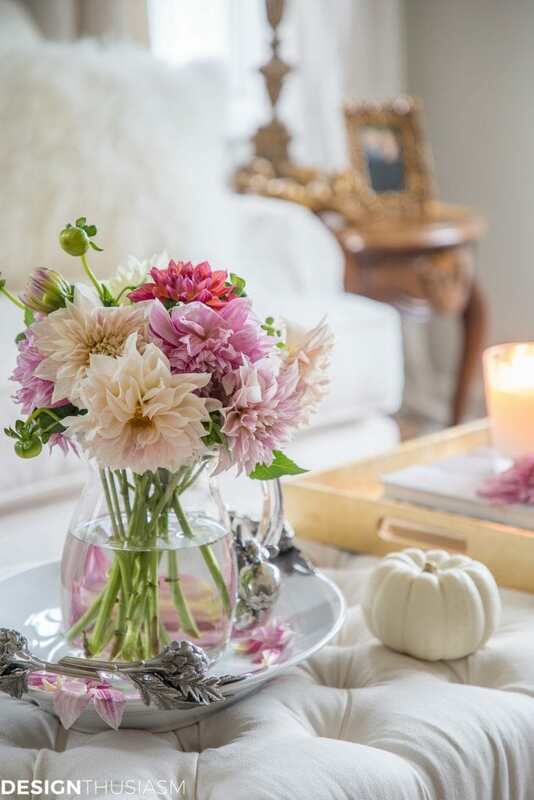 Now it’s time to send you along to Edith & Evelyn Vintage, where you’ll find fresh and beautiful French country fall decor ideas in soft, lovely colors. After that, I hope you have time to look at some of the other links. 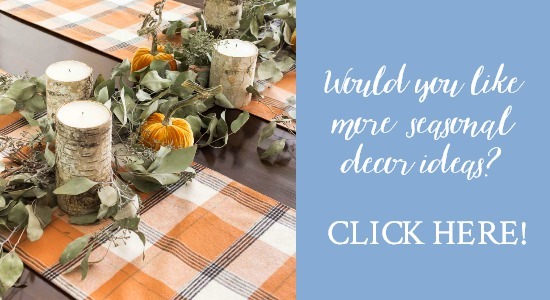 That’s a wrap for this year’s fall decor…but I’ve got some fun things coming up. There will be one more gardening post, at least one more new pumpkin recipe, a tablescape, and (fingers crossed) the clay tag tutorial. Thank you so much for your continued friendship…see you soon! I have an abundance of Lamb’s Ears! I love the way you’ve used them with the pumpkins. How long will they last after they’re cut. Do you put them in water? The lamb’s ear is actually not real…I cut up some faux stems I picked up at Hobby Lobby! I love velvet pumpkins & have a few in my collection. I’m going minimalist fall decor this year with only a very few touches here and there. My velvet pumpkins made the cut however, they’re prominently displayed on our mantel. 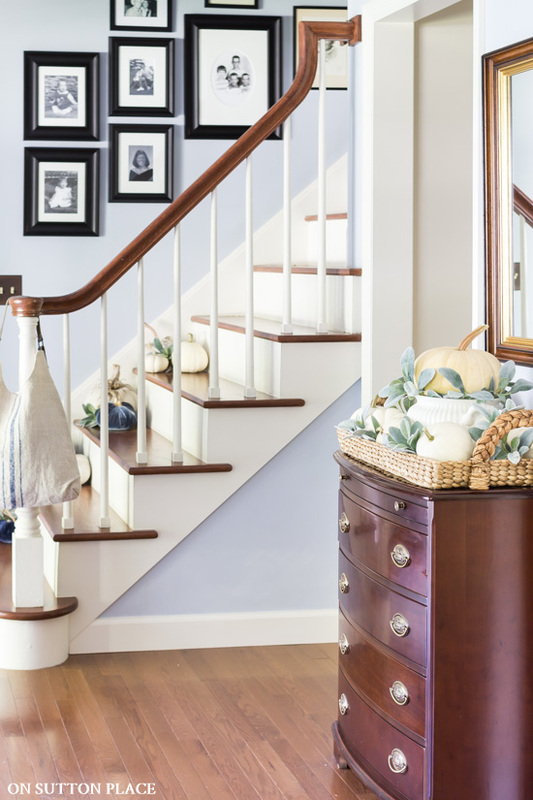 Yours are so cute on the staircase – great inspiration. Love the blue pumpkins, where did you find these? 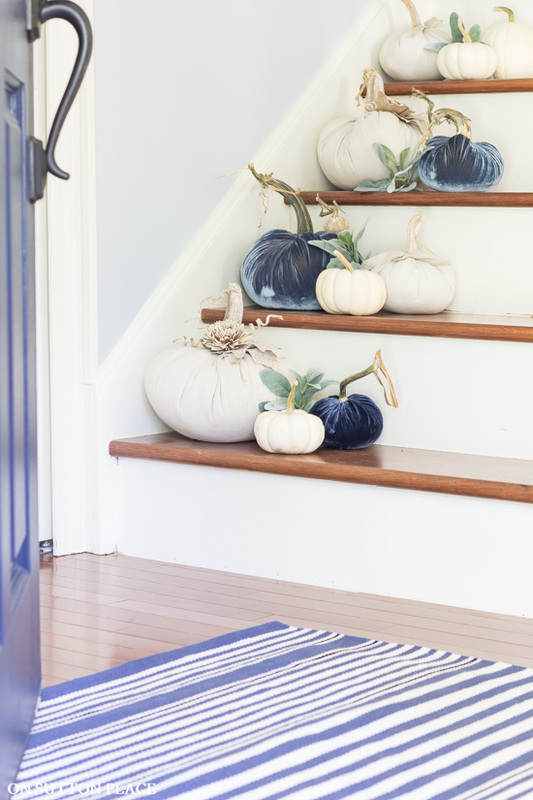 Love the blue pumpkins on your steps! One of my favorite colors. 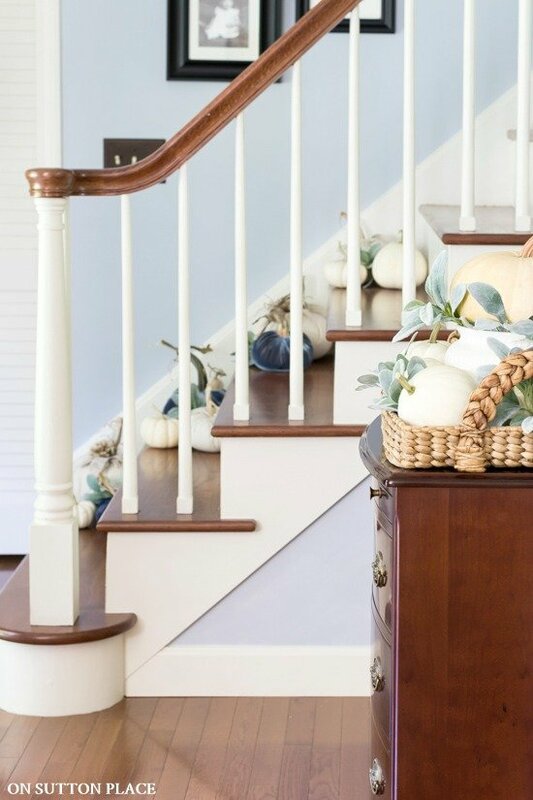 I love the beautiful white and blue pumpkin “gathering” on your staircase. It is striking in it’s simplicity. Ann, what a fun way to display pumpkins! Love the pumpkins on the stairs, so darn cute!! An alternative to fabric pumpkins is to look for gourds that are dried. When I go to “pumpkin patches” I usually find some that are dry or very close to being dried. There are lots of different shapes and once fully dried & cleaned, the gourds can be decorated. I have one that is apple shaped, so I painted it red. On other gourds, I used shoe polish to give them a darker color as well as a shine. Of course, if you check the internet for gourd art, you’ll be surprised at the detail some people carve & paint. I’ve added going to Hobby Lobby to get some of those lambs ears stems since they make such beautiful arrangements. Love the pumpkin display, very simple, but elegant. Thanks so much for joining us Ann – and happy fall! Ann, such a gorgeous way to display pumpkins!! I love your centerpieces, but also loving the bits on the stairs too… :-) I need to start pulling out some of my neutral pumpkins, so you’ve inspired me! Love all the pumpkins especially the ones with the natural stems. Love those blue pumpkins on your stairs!! Where did you find them? Just darling!! Ann, I love your website and your beautiful ideas. I always look forward to seeing what you are doing next!